Ambiance is overrated. There are times when sleeping in Granny’s rented spare room and being woken up by the singing of her parakeets is just the ticket. But more often than not, a cheap, generic, chain hotel experience is exactly what you need. Enter ibis budget and easyHotel. 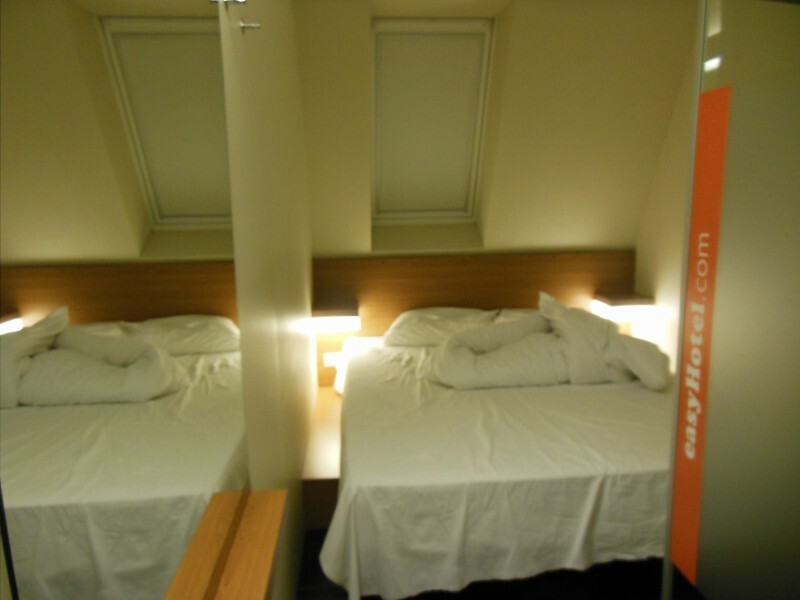 We’ve stayed at plenty of ibis budget rooms since they are perfect for how we travel. Basically, I like a place that’s centrally located and near a transportation hub, which is usually the case for this chain. We dump our bags in the room and only return to shower and sleep, and maybe to eat if it’s too cold outside for a picnic. With prices around €45 a night for a double with bathroom, this hotel chain is affordable and consistent. The rooms are clean (with the exception of the disgusting ibis budget Strasbourg), have heating and air conditioning, comfortable beds, hot showers and free WiFi. (And whoa, the ibis budget room in Poitiers had a multicolor LED oscillating shower head–oh the luxury!) They are found throughout Europe, although the majority are in France. So far, we’ve only stayed in one easyHotel–in Berlin–but I was impressed by the concept and I’d happily return to this chain. The easyHotel chain is modeled after easyJet airlines: a very low base price, with fees charged for any additional services. For our room in central Berlin, we paid a base fee of €38 per night, and then paid additional fees for WiFi and early check in, bringing our total price up to roughly €43 euro a night for a double. Let me repeat that, we paid €43 euro a night a great room in central Berlin. That’s the price of a hostel, minus the roommate barfing at 3:00 am. The room was quite clean, with hot water and a nice bed. And it was tiny. There’s about six inches on each side of the bed, and then there’s a little sink, a toilet and a shower in a wee closet, and that’s it. I’m warning you: there is no privacy in these rooms. Don’t feel like performing your body functions practically on top of your roommate? Then avoid easyHotel. Otherwise, this chain is a winner, and they are popping up in most major European cities.